The Rules of Flat Track Roller Derby Rule Set and Casebook can be found at rules.wftda.com. This mobile-friendly site has been built to hold the latest updates and most complete information on The Rules of Flat Track Roller Derby, with a text-based design for fast updates, a simple navigation menu, and the flexibility for multiple languages. In the future, it will also house all rules-related policies. If you encounter any errors with the site while using it, please report here. 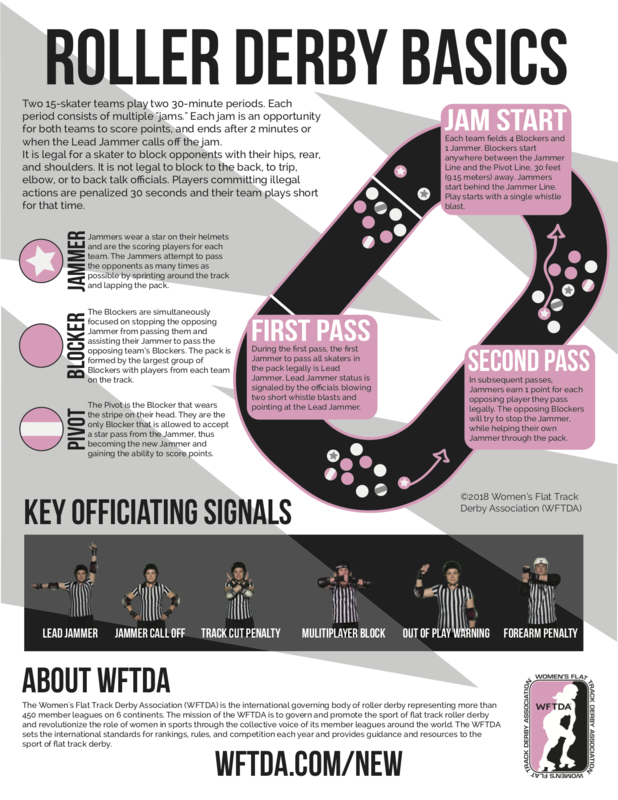 Translated versions of The Rules of Flat Track Roller Derby can be found at wftda.org/rules. Each WFTDA Member League has a Charter team that competes with other WFTDA leagues in sanctioned games that determine placement in the WFTDA Rankings. The top-ranked teams as of the June 30th Rankings compete in Playoff tournaments in late summer/fall, with the top finishers advancing to the Championship tournament. Leagues ranked below the Playoffs cutoff are then seeded into regional Continental Cup tournaments.